In 2009, after a public appeal, the British Library purchased a manuscript ‘Booke’, which Captain Narbrough bought in 1666 and into which he subsequently entered his journals of his voyages and correspondence relating to them. 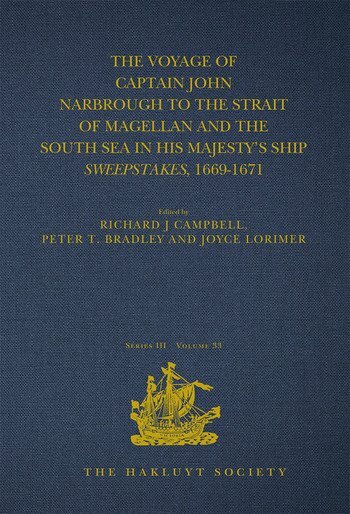 The ‘Booke’ contains his own fair copy of the journal of his voyage through the Strait of Magellan and north to Valdivia in the Sweepstakes, 1669-1671. This is published here for the first time, together with an incomplete and somewhat different copy of the journal, held in the Bodleian Library, which was made for him by a clerk after he returned to England, and which was partially published in 1694. Both versions of the journal together with previously unpublished records made by members of his company, as well as reproductions of the charts which Narbrough relied on and those he produced, are printed here. Narbrough's mission was to carry out a passenger who referred to himself as Don Carlos Enriques and who claimed to have expert knowledge of Peru and Chile, and contacts with disaffected colonists and indigenous peoples. Don Carlos's written proposals to King Charles II and his ministers, only recently discovered, are here translated from Spanish, and give a clear sense of the character, if not the real identity, of an adventurer, who gave the authorities in England, Chile and Peru totally different and changing stories about his status and the purpose of the voyage. Narbrough's conduct of the voyage has been criticized by later authors who have focussed on his inability recover four of his ship’s company from detention in Valdivia and the lack of tangible results, in the form of trade or contacts with indigenous groups. The more complete story provided here shows that Narbrough carried out his ambiguous orders to the letter. His chart of the Strait of Magellan remained the principal chart of the area for the next century. King Charles II and James, Duke of York, both recognized his abilities. He was rapidly re-employed in naval service, subsequently knighted, and rose to become a Commissioner of the Navy and Commander in Chief in the Mediterranean. PART IV A Declaration made by one Charles Henrique Clerck off the Proposalls made by the Royall Compania for trade, to his Majestie Anno 1663. 4. Subsequent Publications containing Narbrough’s ‘The Voyage to the South-Sea’, 1694. Captain Richard Campbell (OBE) joined the Royal Naval College, Dartmouth in 1946. Having completed training and served for two years in submarines he specialised in hydrographic surveying joining HMS Dalrymple in 1956. He was present at the landings in Port Said that year and assisted in the subsequent salvage operations. He has carried out hydrographic surveys in a large number of areas around the world. He served for two seasons in the Antarctic and Falkland Islands, during which time he in Valdivia and went to the Strait of Magellan numerous times as well as making a passage through it. He has had two periods as Officer in Charge of the Royal Naval Hydrographic School and commanded four surveying ships, the last of which, HMS Hydra, 1980–2, was employed as a hospital ship during the Falkland Islands war in 1982. He served as Assistant Hydrographer 1977-79, and retired in 1983 to spend twelve years in charge of the Admiralty Sailing Directions in the UK Hydrographic Office. His previous publications for the Hakluyt Society are The Discovery of the South Shetland Islands, 1819–1820, The Journal of Midshipman C.W. Poynter, 3rd ser., 4, 2000, ‘The Journal of HMS Beagle in the Strait of Magellan by Pringle Stokes, Commander RN 1827’, in Four Travel Journals, 3rd ser., 18, 2007 and ‘The voyage of HMS Erebus and HMS Terror to the Southern and Antarctic Regions, Captain James Clark Ross, R.N. 1839–1843, The journal of Sergeant William K Cunningham, R.M. of HMS Terror’, in the on-line Journal of the Hakluyt Society, 2009. Peter T. Bradley has published the first studies about Don Carlos Enriques and is an expert on the Spanish naval defence of Peru in the seventeenth century. Joyce Lorimer has published two volumes with the Hakluyt Society, on English and Irish interest in the Amazon and Guiana in the Tudor and Early Stuart period.